Something that would be a lot of fun to use as a treat for the Pinewood Derby would be Raisin Racers. Turn a small raisin box into a racer! Step one print this PDF. Step two is to eat all the raisins from a 1 1/2 oz raisin carton. Next, or while you're doing that, color in the racer and cut along the outside dotted line. 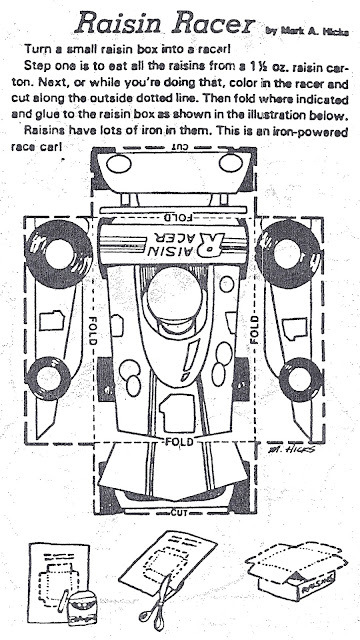 Then fold where indicated and glue to the raisin box as shown in the picture. Raisins have lots of iron in them. This is an iron-powered race car! Click here for a PDF you can print and have the kids color.